Read more about David Abulafia. The latest addition to the growing library of books on Mediterranean history is one of the most outstanding. In the veritable renaissance that the study of the enclosed sea in all its different dimensions has enjoyed over the past few decades, the exportation of an ‘academic’ Mediterranean to a wider audience around the globe must be one of the hallmarks of the globalization of the subject, making it accessible enough to stimulate a scholarly search for parallel stories to the one that the old sea has to tell us. In David Abulafia’s magisterial The Great Sea. A Human History of the Mediterranean, the use of the singular in ‘Human History’ is as significant as that of the plural in the scheme of classification of enumerated ‘Mediterraneans’ that it adopts. A ‘First Mediterranean’, extending from 22000 BC to 1000 BC, is encapsulated in a sixty-page synoptic journey which lays out some of the main themes to unfold across the rest of this voluminous history – the forces of isolation and insulation, the interaction between Sea peoples and Land peoples. The battle cries of a heroic Mediterranean merge with the clank of bronze and copper wares traded along vibrant sea lanes. A ‘Second Mediterranean’, covering sixteen centuries or so of history from about 1000 BC to the great watershed of around 600 AD, takes the narrative along the coasts of the Great Sea on board the ships of the ‘purple traders’ and their Greek counterparts, ‘heirs of Odysseus’, who transform the Mediterranean into a thalassocratic lake, whose waters, through the pages of this book, are made to reflect again the resplendent light of the ‘Lighthouse’ of the Ptolemies. The titanic struggle for supremacy between Carthage and Rome, here reconstructed in vivid detail, paves the way for an era of Roman dominance which entitled the sons of the Tiber, more than anyone else before or ever since, to speak of the Mediterranean as ‘Our Sea’. Across the vibrant landscape of the Roman mare nostrum, the deep-seated currents unleashed by the great waves of eastern faiths transform the communities around the Mediterranean and across it in fundamental ways. The Mediterranean of the Phoenicians, the Greeks and the Romans disintegrates in the creative chaos of the Germanic fragmentation of the Roman lake, where the gradual detachment of the eastern and western halves of the middle sea is underlined by a short-lived but remarkable Vandal thalassocracy. The cataclysmic effects of war and the plague pandemic set the scene for the onset of the ‘Third Mediterranean’, extending from the 600s to the mid-fourteenth century, where the broad medieval canvas of a Mediterranean shared between the Muslim Caliphates, Byzantium and Latin Christianity provides the author with an ideal drawing board to share his intimate knowledge of the period. In the wake of the expansion of Islam across a substantial part of the Mediterranean world, the author underlines the view that the new monotheistic faith did not destroy the unity of the mare nostrum; rather it helped restore some of it. The Mediterranean of the Fatimids and the Cairo Geniza is brought to life, as is that of the nascent maritime centres of the Italian peninsula who cast their gaze across the water towards the emporia of Dar al-Islam, and a resurgent Byzantium, never reconciled with the loss of former provinces of the Christian oikumene. Across the boundaries of the Muslim and Christian Mediterraneans, intricately woven networks were developed by the Jewish merchants whose lives and activities were recorded in that most astonishing of primary historical collections. The world of the Cairo Geniza unravels slowly with the ‘Great Sea-Change’ of the eleventh century, which in the age of the Reconquista and the crusades in Syria and Palestine leads to a Latin Christian commercial hegemony across the inland sea. Against the changing political mosaic of rising and declining polities, the efforts of soldiers and sailors, merchants and missionaries plying the sea lanes and the ports, come together in the author’s distinctive formula of a human history. The enclosure of the Mediterranean marked by the author with the fall of Acre in 1291 did not undermine the achievements of the century of the Commercial Revolution. It did, however, usher in the conditions for a ‘Fourth Mediterranean’, born out of the cataclysm of another great pandemic. The march of the Black Death across the Mediterranean, oblivious to the ephemeral boundaries fixed by polities, provides an apocalyptic backdrop to the rise of the Ottoman empire, which by 1453 seemed to reinvent itself for the more adventurous subjects of Mehmet the Conqueror into ‘a revitalized Roman Empire controlled by Muslim Turks who would combine Roman-Byzantine, Turkic and Islamic concepts of rule’ (p. 385). Where else if not in a Mediterranean context could civilizations so diverse come together in this manner? The author’s decision to extend the ‘Fourth Mediterranean’ across the whole gamut of early modern experiences down to the nineteenth century may not necessarily be shared by all readers, in particular those trained to look for a late sixteenth-century turning-point concluding the epic clash of the Habsburg and Ottoman powers in the classic Braudelian Mediterranean. Indeed, the vivid narrative detailing the battle for Akdeniz, culminating with Lepanto in 1571, is seen by the author as a great watershed leading to a geographical division of the ‘White Sea’ in two halves: the Spanish-controlled West versus the Ottoman-controlled East. In a sense, this geographical bisection was to give the inland sea an unprecedented, if ‘backyardly’, stability, through the geopolitical shifts of the early modern centuries towards the new centre of gravity of the Atlantic economies, marked by the arrival of northern ‘interlopers’, notably the English and the Dutch, and the diasporas of the ‘desperate’. In a world where cultural boundaries were constantly traversed, ‘the seventeenth-century Mediterranean, with its renegade corsairs, its displaced Moriscos, its Sabbatian converts, its “Portuguese” merchants, was therefore a place in which religious identities were constantly distorted and reshaped’ (p. 483). The still-enclosed sea of the Russians and the British, who blocked France’s Napoleonic vision of connecting the maritime bridge between the heartlands of Europe and Asia, blends into the ‘Fifth Mediterranean’ which comes of age with the opening of Suez. The ‘Great Sea’ would now shrink somewhat as it became a connector of oceanic economies, but it soon reinvented itself as a major global artery and a vibrant theatre of nationalisms. The laws of supply and demand which had been employed with much dexterity by the purple-trading pioneers were now deftly managed by the marketers of modern conspicuous consumption across the same shores, with cruise ships replacing the corsairs, and powerboats instead of pirate ships. Abulafia’s fine pen weaves an intricately researched text, which is supported by nearly eighty pages of endnotes bearing more than 1800 references to a wide spectrum of sources. The volume is enriched by a series of maps of the Mediterranean illustrating the transformations taking place across time, as well as a selection of 75 photographs which take the reader on a journey from prehistory to the present day. In an age when satellite technology and the internet have made of the ‘Great Sea’ but a small element in the global mosaic, one, nevertheless, where the periodic loss of lives in yet other desperate diasporas across continents sadly still occurs, David Abulafia’s history of the Mediterranean distinguishes itself by adopting a unit of analysis which concentrates on the Mediterranean Sea and the islands across it, its shores and their connectivities. The role of the Mediterranean crossroads in bringing together the people from across it, and far beyond, is highlighted through a narrative style which ensures the place of the story in the history. 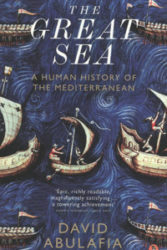 The narrative which emerges in the pages of The Great Sea, linking the sequence of Mediterraneans, is a connected narrative, held together by the underlying message that the history of the Sea is more than the sum of its parts, and larger than the mosaic of national histories which had traditionally supplied the raw material of the majority of Mediterranean history books. In this sense, David Abulafia’s account of Mediterranean history reads like a biography of the Sea and its people. The Mediterranean of David Abulafia, with its convergences and its controversies, its convictions and contradictions, is a human sea in which both seasoned scholar and shy beginner are invited to swim. By restoring an enthusiastically woven historical narrative to a subject where Braudelian longue durée had almost dispensed with that ‘surface’ level of the past thronged by people and places, the history of events which gives historians their readership and probably their wider relevance, the book also underscores the positive message that different historiographical approaches can share ideas, exchange contrasting viewpoints and overlap healthily across the same fundamental connectivities of the Mediterranean in a complementarity which takes the Great Sea beyond its modern academic ‘Pillars of Hercules’. This is one of those rare books which combine meticulous and extensive historical research with the pleasant style of a keen storyteller, to make the complex tale of one of the crowdiest places across the globe a truly global showcase of humanity.